Show your second-best option first to create a frame of reference and contrast for the best option. 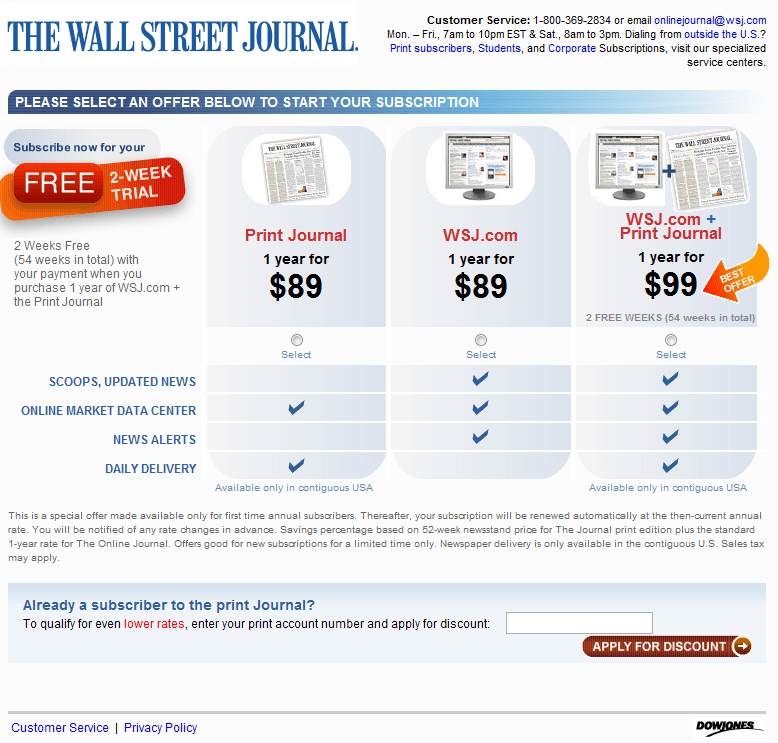 The Wall Street Journal uses perceptual contrast to encourage subscribers to pick the bundled option. Choosing just print or just online delivery seems crazy when you can get both for just $10 more. The artificial pricing of the individual options allows the bundled subscription to appear comparatively more enticing. The bundled option just seems so much better value in contrast to the previous options. Humans aren’t very good at judging absolutes. We’re better at judging comparative values. In fact, this perceptual contrast can play tricks on us. If you put one hand in a bowl of cold water and the other in a bowl of warm water, then move both to a bowl of room temperature water, the cold water hand will feel hot and the hot water hand will feel cold. Perceptual contrast is all about tricking the brain into perceiving a bigger difference than actually exists by making comparisons between less and more desirable options that tend to inflate the characteristics of the more desirable option.This works best when the second-best option is shown first, and in minimal but sufficient detail. This second-best option should be “good enough” – sufficiently similar to allow comparison – but the second option should be sufficiently better for contrast. Always have a secondary object that is sufficiently similar to your primary object to be considered a good comparison, but sufficiently less desirable to create perceptual contrast. Introduce the secondary object before the primary object. Even if they appear on the same page, make the secondary object appear first or to the left of the primary object. Share information about your secondary object, but not as much information or in as much detail as you subsequently share about your primary object. Artificially inflate the cost of your secondary object or reduce its feature set/desirability in order to make the primary object appear comparatively good value for money, even though it is more expensive.